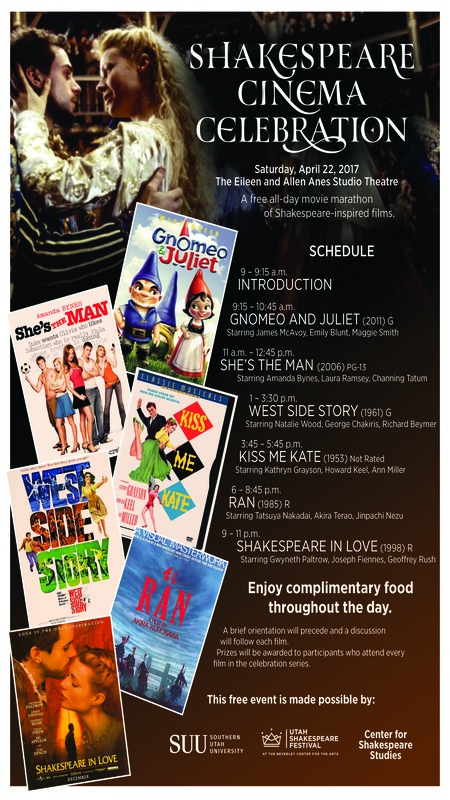 CEDAR CITY — In celebration of William Shakespeare’s birthday, the Utah Shakespeare Festival education department and Southern Utah University’s Center for Shakespeare Studies are sponsoring the “Shakespeare Cinema Celebration” on Saturday in the Eileen and Allen Anes Studio Theatre. While the bard’s recognized birthday is actually Sunday, the all-day movie marathon is happening a day earlier and will features film adaptations of Shakespeare’s plays, with lectures and discussions occurring before and after the viewing of each film. Participants are invited to attend any number of movies. Prizes will be awarded to those who attend every film in the celebration series. This event is free of charge and all are invited to attend. Please be aware that not all movies are appropriate for all age groups. “Gnomeo and Juliet” (rated G): 9:15-10:45 a.m.
“She’s the Man” (rated PG-13): 11 a.m.-12:45 p.m.
“West Side Story” (rated G): 1-3:30 p.m.
“Kiss Me Kate” (Not rated): 3:45-5:45 p.m.
“Ran” by Akira Kurosawa (rated R): 6-8:45 p.m.
“Shakespeare in Love” (rated R): 9-11 p.m.
Last year a diverse audience of over 120 students, professors, community members and patrons attended. Some of the guests traveled from as far away as Flagstaff and Kingman, Arizona. Audience members are welcome to enjoy the seating or bring a blanket and pillow. When: Saturday, April 22, 9 a.m. to 11 p.m.
Where: Eileen and Allen Anes Studio Theatre, 195 W. Center St., Cedar City.